The Queensland Art Gallery | Gallery of Modern Art (QAGOMA) today paid tribute to leading Australian artist Mrs Waal-Waal Ngallametta who passed away on 28 January at her home in Aurukun, Cape York. QAGOMA Director Chris Saines said Mrs Ngallametta (b.1944) had made a profound contribution to arts and culture nationally and particularly in Queensland, her home state. ‘Mrs Ngallametta, an elder of the Putch clan and a cultural leader of the Wik and Kugu people of Aurukun was one of the most well-regarded senior community-based artists in Queensland,’ Mr Saines said. Freshwater swamps and waterlilies were a recurring subject in Mrs Ngallametta’s work, as were important sites such as Ikalath – where she collected many of the pigments that were then used in her paintings depicting that place. ‘She was known for her mastery of weaving using traditional materials and recycled driftnets and marine debris, as well as her unique paintings, that often combined figurative scenes with meandering, shimmering dotted patterns over bold ochre fields,’ Mr Saines said. Queensland Arts Minister Leeanne Enoch praised the powerful artistic legacy of Mrs Ngallametta. 'As an artist, elder and inspiration, Mrs Ngallametta has blessed Queensland with her collection of work and with her personal vision of Country,' Ms Enoch said. 'Mrs Ngallametta was a finalist numerous times in the National Aboriginal and Torres Strait Islander Art Awards (NATSIAA), winning its General Painting Award in 2013 and she was the winner of the Cairns Indigenous Art Fair’s People’s Choice Award in 2018. 'I join the Queensland arts community in paying tribute as we mourn her passing,' Minister Enoch said. In 2015 Mrs Ngallametta was featured in ‘GOMA Q: Contemporary Queensland Art’, a survey of works by more than 30 senior and emerging Queensland artists presented at the Gallery of Modern Art. 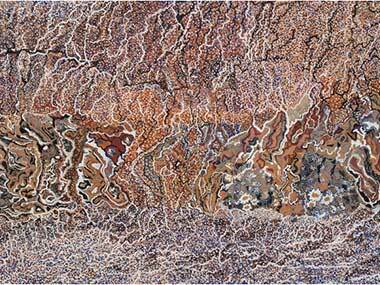 ‘GOMA Q’ included Wutan #2 2014, Ngallametta’s large-scale painting of her adopted son Edgar’s Country, which is just inside the mouth of the Aurukun River, near the open sea. Among the eight works by Mrs Ngallametta held in the QAGOMA Collection are early paintings such as Mo'Yakal (White and yellow wattles in flower) 2008, Pamp (Swamp) 2009 and Collecting Pip Morp (white clay) at Ikalath 2009. ‘QAGOMA recognises Mrs Ngallametta’s contribution and dedication to her community and her impact on the state’s visual culture, and offers its sincere condolences to her family and friends,’ Mr Saines said.